This download comes with a light gray watermarked background, but you can purchase a clean, clear Color-Coded pH Food Chart on glossy card stock that is durable in and around the kitchen. Click here for the FREE pH Food Chart! So many bottled waters are acidic! Find out which common brands are safe to drink, which are to be avoided at all costs!! Remember you drink the leached plastic from the bottle, so only buy bottled water if you must! You probably know it's best to drink high alkaline water from your own water ionizer, but if you're stuck buying bottled water when you're out make a wiser choice with this handy chart you can fold up and keep in your wallet. Print out several and give to your friends and family! Click here for the FREE Bottled Water Pocket pH Chart! 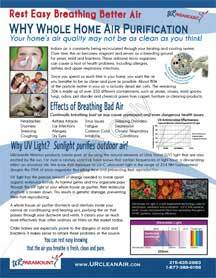 Why do you need UV light to purify your indoor air? Find out with this info. Your home or office air could be making you sick - headaches, asthma, dry eyes, dizziness, sneezing, coughing, fatigue, respiratory conditions, sleeping disorders - could all be caused by BAD air! Click here for UV & Air Purification INFO! » How Safe is Your Tap Water? Same 84 minerals we need, same frequency as our body! Learn the symptoms, print & post this paper - save your loved ones' lives! Please!